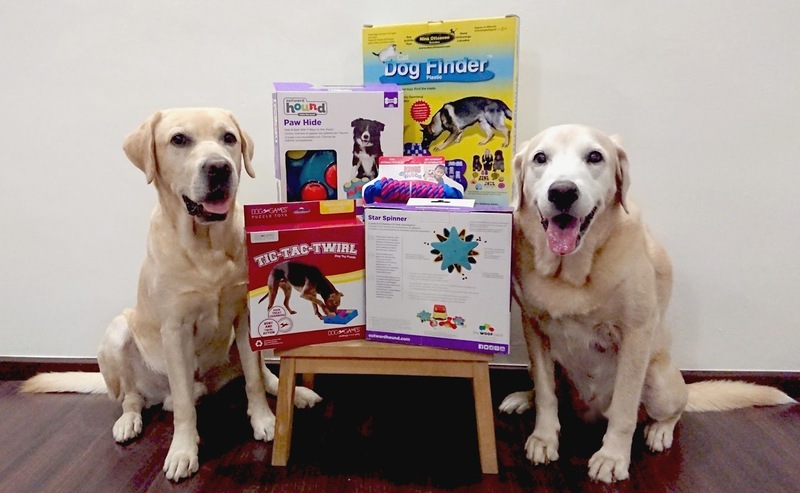 And so it begins, my second season of toy review for Kohepets and my very first toy review for 2018! Unlike season one where I covered the 'action' toys, Miss U and I decided it was time to focus on interactive dog toys. My loot of interactive toys for season two of reviews... except ONE! Can you spot the odd one out? As usual, I have a budget of $250 (retail price!) for my toys selection. Miss U had very kindly organised a range of interactive toys for my selection. After we agreed on the toys selection and the transaction was finalised, my blonde eye lashes fluttered in a flurry like an antenna picking up a signal call. "Miss U! Miss U! Can I please add the KONG Tugga Wubba to my loot? I need that toy. I want that toy. I MUST HAVE that toy!!! ", I asked her with all excitement I could conjure up. Miss U agreed to add on to my loot even though I would go over my budget. Flashbacks of daddy's toys played in my head. We, Frodo and I, really need this toy. See video below for the story of how we got the Tugga Wubba. True story. As you can see from the illustration above, the Tugga Wubba toy was developed for tug-of-war as well as toss and fetch. When I first saw the 'ropey' bit of the toy, I knew it would withstand Frodo and my monster mouths should we start chewing on it. 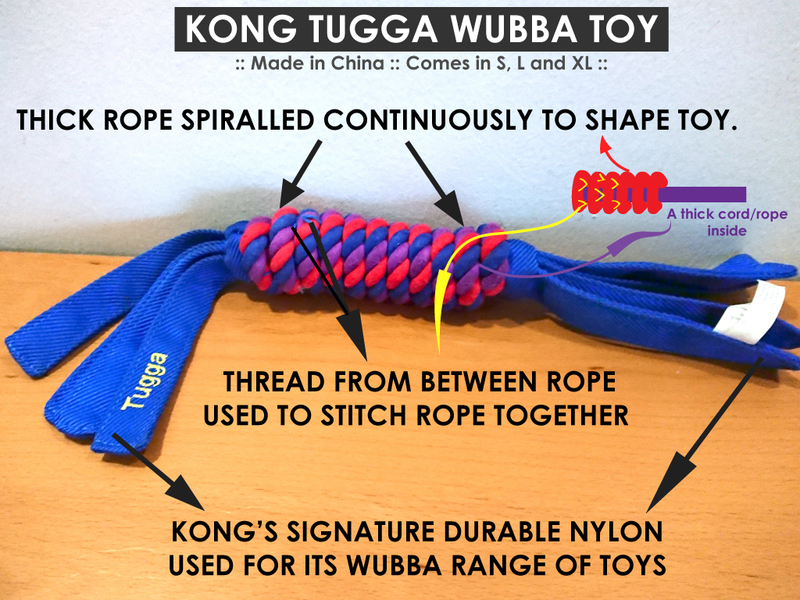 The incorporation of Kong's trademark Wubba nylon 'feeler' at each end was much appreciated. The Tugga Wubba is not just one of those typical rope toys that I, Flapper Choo, am fully capable of untwining the ropes in minutes. For what seems to be a simple tug toy is really quite smartly designed with durability in mind as well as interactive fun between dog and human... and dog and dog too (watch above video). 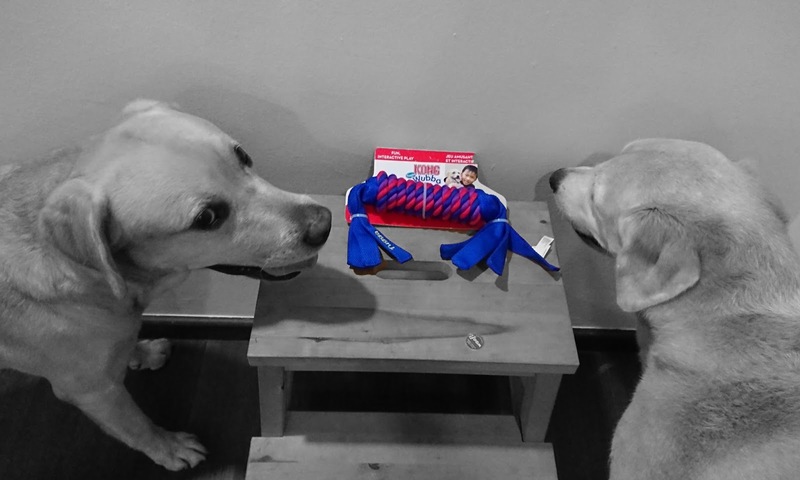 Priced at SGD18.00 for the large (L) Tugga Wubba, I felt it was reasonably priced for a dog toy especially if it is durable. The small (S) is priced at $13.00 whilst the x-large (XL) is at $23.00. Sorry guys. No medium in the mix! However, having been zinged once by KONG, I hoped the Tugga Wubba would be as sturdy as the photo showed. But their Wubba toys have proven trustworthy thus far so that boosted my fragile confidence on its quality. When the Tugga Wugga arrived, it did not disappoint! I could tell right away it was going to be durable toy. Bring on the tug of war Frodo! Shortly after I started my dog therapy work with the elderly, mummy started looking for a toy she could bring with to motivate them to play with me. Most of the elderly has movement problems (fall risk as well) which meant that they had to be seated at all times and could only stand up with assistance. So the toy selected has to be one that is safe, does not get drowned in [my] saliva easily, easy for them to hold and release, produces a good toss vertically and horizontally and best of all if it an encourage game of tug. Then mummy remembered my new Tugga Wubba! She was confident it met the criteria listed above and the attractive colours was a bonus. She packed away with my existing lot of toys we use for therapy and the rest is history. The Tugga Wubba is now my staple toy for dog therapy. This is just a demo which daddy very kindly to help me with. Mummy does not get a chance to take photos or videos when I am working and we need to preserve the elderly's identity too. Daddy's demo is a very tame version of what actually goes on during the therapy session. The elderly can be very cheeky. They would flail the Tugga to tease/taunt me, feign innocence only to throw it pretty darn far, lob me with their toss so I can't catch it and once there was a lady who stood up with much gusto without assistance just to fling the toy. She gave the staff a panic attack with her action. The elderly can be filled with mischief no doubt about it. But watching their progress and seeing them break out in laughter and applause is absolutely rewarding. What started out as that proper tug toy for Frodo to irritate me has become my unique work toy. Unique means it is only brought out and used during my therapy sessions with the elderly. Once in a while, mummy may relent and let Frodo have it to irritate me. Fun for both humans and dogs. Got to give it 5 Flaps! I get to irritate Flapper with it, I get to stuff it into his mouth, I can play tug with Flapper.... Defintely 5 DOH! Overall, it is a sturdy and durable toy. It is surviving our monster mouths and play. However, with the stitching starting to loosen and peep at me.... got to give it 4 Flaps. The classic Wubba nylon material does not stain easily and my Tugga still looks pretty darn good. It should easily be machine-washable although I suspect the ropes may take quite a long time to dry. For its quality, durability, presentation and design thoughts, SGD18.00 is good value for money. Definitely 5 Flaps! Absolutely yes. I am thinking maybe I should get a spare in case this spoils and well, another one for Frodo... maybe? With this, my first dog toy review for 2018 is done! For anyone who is interested in purchasing the KONG Tugga Wubba, you can get it from Kohepets. It is currently out of stock but I am sure they will happy to assist you with the stock status! Next up, we will be reviewing Outward Hound PAW HIDE Puzzle Toy.